To juxtapose is to place one distinct thing next to another. Salt next to pepper. Heavy metal next to Mozart. 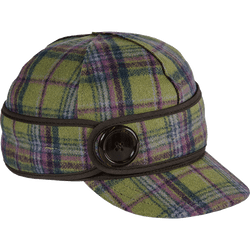 Our waxed cotton cap takes on new life juxtaposed with a HARRIS TWEED earband - for looks, for utility, for the beauty of contrast. Within the first 10 minutes of wearing my brand new hat I was approached by a total stranger who told me how much they like the hat. Mic drop. Best Birthday present I’ve ever picked out for myself. Expect lots of orders from Durham NC. It's a great hat. I ordered one for my husband and brother. Both already had wool SK's. 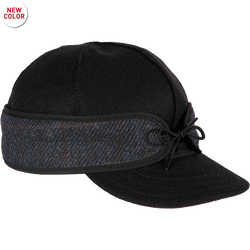 Because this hat has a fabric lining rather than the felt, it runs big. One size smaller for both men worked better. I would order one size smaller. I have had this cap for 3 months now , and it has become my everyday cap. Great fall cap come rain or shine. Great fit. Rugged construction. Sheds water. 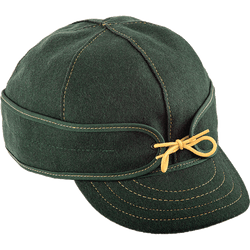 This is now my go to Kromer! I've had so many compliments on it. Great Fit. Great Look. I will be buying another for my Dad.